I didnt know that is possible…. the yolk color also quite match it seems. hmmm… yummy. My kwai lo hubby likes salted agg. Will try to do it at home some times. Waaa, this is so educational! Now I just need to find some ducks and get them to lay some eggs! Which is highly unlikely! All the ducks I’ve seen have migrated to EuroDisney..
Pssst! I’ll swap the ‘Beijing Bicycle’ dvd for the eggs. Deal? I never eat duck eggs like that. Usually we have them when they look black and then we eat it it with our congee. thanks for the tips. will try pretty soon..
good, i can try your recipe and see. mil has her own recipe but has to wait for 30 days. she uses chicken eggs. she got some made for the dumpling festival. i love salted egg yolk too! so yummylicious! never thought about making them though…but err…how come the ones we buy from the market is coated in black ash? This is just wonderful! I would prefer homemade ones so as to control the ingredients. Less salt etc, and no preservative. I’m going to try it… the problem is, don’t know if I can get duck eggs. Here the salted egg costs about $1 each, still not so bad. But the century egg costs $2.90 each…Ridiculous. I also want homemade preserved century egg recipe. wow! that’s nice tho’ i’m not the type who really like salty egg. I didn’t know that we can make that at home. thanks for sharing. You mentioned the old lady uses chicken eggs to make salted eggs, you means chicken eggs also can make into salted eggs ah? hmmmm….think I learnt something new again today! looks yummy..hmmm where to get duck egg? Only Duck egg? do you have to put it in a cool area or where there is sunlight? sorry..just checking ya. Sometimes temperature has to do with its’ success! wahh cool..liddat no need to buy from outside lor, dunno how they preserve it hehe..
Silly me, all this while I thought duck egg is salted edi. *tougue out*. Oh really ??? I will definitely try this out sometime cause me and my maid lurve salted eggs. never see duck eggs for sale wor. normally its salted edi. maybe i shud try also! thanks ya! not easy to get duck eggs, my aunt use to buy at those wet market (cos my granny like it), person who sell normally old lady and there ‘bela’ their own duck.. 🙂 Rm0.70 sebiji …. can find at kajang wet market ..hehehe. sounds simple…but do i get duck eggs here?? Salted duck egg no need to store in the fridge liao as they are already preserved. That is what I was told by the ah pek who sell them. So interesting. Maybe I’ll try. I love salted eggs but have always only eaten hard boiled ones. Never tried using them like normal eggs. Now you can have totally homemade porridge…including the salted eggs. What a nice touch! same as Allyfeel, now only i know duck egg is not salted one! haha..
i m going to try it out later, thanks for the sharing! The taste matches as well, but I don’t know how they get the ‘oily’ yolk like some salted eggs do. Not bad for a kwailou, your hubby. We once tried to ask a kwai lou colleague to try salted egg yolk, and boy, what a torture it was for that poor guy. He spit out immediately after we turned out backs. Catch one, rear one, do whatever to get one. Then you can have rose duck, Loh-mai-ngap, hum ngap tan!! Pst, Beijing Bicycle X-rated or not? If yes, will give you more eggs. Aaah, what you have is century egg. I like them too, but I really don’t like some which gives out very strong ammonia smell. Blech. Let me know how it turn out. Yes, the lady I met in the market was doing it for dumpling festival. I keep mine in the fridge, even the ones I bought from the shop. 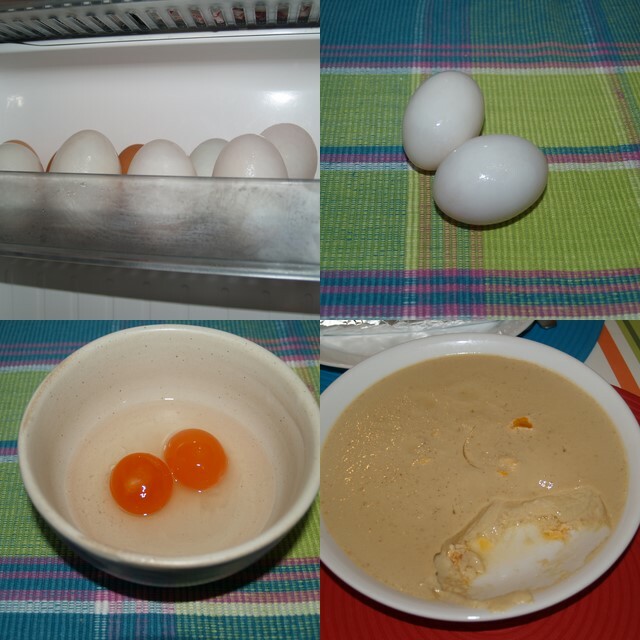 Refer to Hijackqueen’s comment, she said since the egg is preserved, you don’t have to store them in the fridge. I’m not sure if chicken eggs take longer, you can try and let us know. The black ash I guess is what they use to make the egg salty. Not very sure though. Since I didn’t know what the content of the black ash is, I thought I should make my own, at least I know what goes in there. Sydney China Town has no salted eggs? Maybe all grabbed up for dumpling festival. You can substitute duck eggs with chicken eggs, they should work the same. Yes, I had the same thought. What is sold outside, you really don’t know what they put in the process of making them. You can substitute duck eggs with chicken, they work the same. I used duck eggs because salted chicken eggs are so widely available here, it’ll be more ‘rear’ to have salted duck eggs. Anggie sent me a link for century egg, I’ll send to you. Aaaah.. but they are so delicious..
Use chicken eggs instead. Process is the same. Chicken eggs can be used as well, but I thought duck egg would be more rare. There was no instructions to say where the bottle needs to be placed. I just put mine near a cool kitchen corner, it wasn’t dark but neither was it directly exposed to sun light. Century egg got, Anggie just sent me, but needs to use chemicals, I don’t know where I can find those chemical solution. Alamak.. duck egg == salty? Haha. I’m sure Penang will be easier to get then here. But if you can’t find duck eggs, chicken eggs can do as well. Hey, I got mine at RM0.60 from a Malay vendor. Btw, thanks for the century egg link. Singapore? Err.. I won’t know. Yes, you can definitely try using chicken eggs, the post that I saw on the net was for chicken egg. I didn’t know that, but since fridge got space, I’ll prefer to keep them there to let them remain fresh. I like them hard boiled as well. I don’t use them like normal eggs, but when I steam egg, I like to put the chop up salted egg yolk in. Also, try frying omelets with chopped salted egg stirred in the beaten egg before frying, it’s nice to. Gives the omelets a grainy taste. Yes. If I can make my own century egg, that’ll even be more heavenly. Haha.. you ladies are funny. hey…. this is so so good la. i looooooooooove salted eggs… so just put the eggs into the boiled salt water? alright… to the market i go! Wow! I will need to try this!! It seems like so easy…I’m going to try it out too!!! This is definitely worth trying. Thanks for sharing. Cool, i am going to try this when i go home..first hance i get 🙂 Thx for visiting my blog . Good…i want to make mine soon..i like to eat salted egg. btw, just wanna inform you i have bought the milkmaid tea..hehe..thanks for your info. Thanks for your sharing… I will try this! Loong bought 3 salted eggs last week, soooo taste-less… The most no-salt-taste’s salted eggs I had every tried!